Ruth Johnson, of De Graff, died on Tuesday, January 22, 2019 at the Rice Care Center in Willmar at the age of 86. Funeral services will be held on Saturday, January 26, 2019 at 10:30AM at Immanuel Lutheran Church in Clara City, MN. Rev. Joel Gueningsman will officiate and interment will be in Sunset Memorial Cemetery in Montevideo. Visitation with the family will be held on Friday, January 25, 2019 from 5PM to 7PM at the Immanuel Lutheran Church in Clara City, with a prayer service at 6:30 PM. Visitation will continue one hour prior to services at the church on Saturday. Ruth Mae Lietz was born January 19, 1933 in Grace Township to Fred and Alma(Garbe) Lietz. She was baptized and confirmed at St. John’s Lutheran Church. Ruth graduated from Montevideo High School in 1951. She married LeRoy Johnson on February 24, 1952 at St. John’s Lutheran Church. Together they had four children. Ruth was a member of the funeral circle group, and Ladies Quilt Guild at Immanuel Lutheran Church in Clara City. 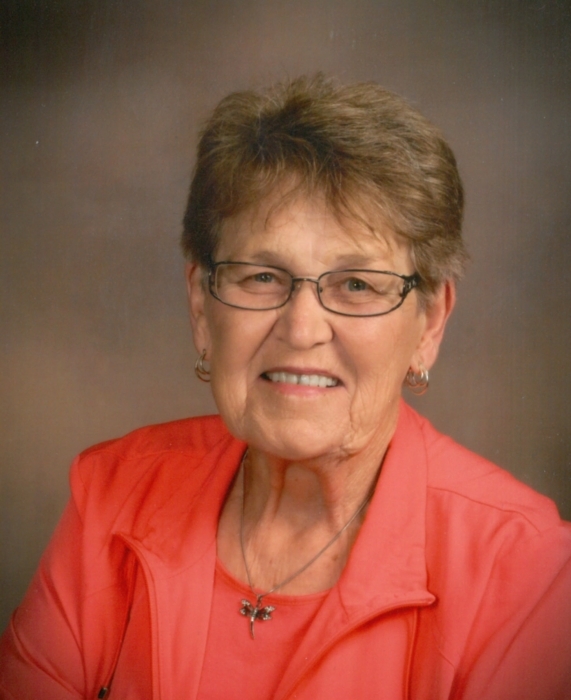 She enjoyed spending time with her children, grandchildren and great-grandchildren playing cards and dice games, especially Kings in the Corner, and Buck Euchre. Ruth loved polka music, and would listen to it frequently on her radio at home. She also enjoyed quilting, knitting, gardening, and baking. Ruth’s doughnuts, buns, and lefse were very popular with all of her grandchildren. She is survived by her four children, Debra Foley, of Spicer, MN, Bradley (Linda Maus) Johnson, of Maynard, MN, Bruce (Gail) Johnson, of Montevideo, MN, and Bryan (Judy) Johnson, of Loveland, CO; grandchildren, Nicholle (Jason) Peterson, Michelle (Daniel) Petersen, Jonathan (Jessica) Foley, Alysia (Jeremy) Huerd, Maria (Justin) Wilson, Kyle (Lindsey) Johnson, Kayla (Matthew) Brown, Jennifer Johnson, Samantha (Anthony) Wolf, Phillip (Becky) Johnson, Jordan (Desiree) Johnson, Rebecca (Dillon) Pieper; and great-grandchildren, Megan, Madison, Jacob, Meredith, and Joshua Peterson, Wyatt, Isabella, and Liam Foley, Sophia and Desirae Huerd, Ashley, Adam Mapes, and Lucas Wilson, William and Carter Johnson, Anika, Nina, Julia, and Maia Brown, Ethan and Leah Wolf, Mallory, Alex, and Samuel Johnson, Quinn and Henry Johnson, and Natalie and Declan Pieper. She was preceded in death by her parents; husband, LeRoy; brothers, Harry and Leroy Lietz; sister, Elaine Johnson; and son-in-law, Kevin Foley.